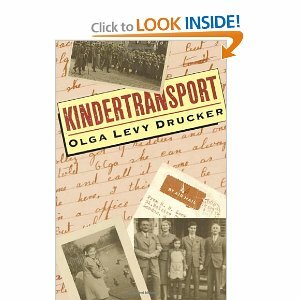 Kindertransport first starts in Stuttgart, Germany in the winter of 1935. later in the book on March 3, 1939, Olga takes the Kindertransport to London, England and stays there. She then goes to Wellingborough, England. Olga Levy Drucker was always a shy girl. She lived during the time we now know as the Holocaust. The whole story is all about Olga trying to escape from the Nazis and at the same time, find a spot for school. One night when Olga was sleeping, some Nazis came into Olga's house and took her father. They took him to a concentration camp, and then later threw him back. By then Olga's parents realized that life in Stuttgart was too dangerous for a girl like Olga. They decided to put her on the Kindertransport to London. The Kindertransport is a train that takes kids to other areas away from the war. Olga was then a Jewish Refugee from that point on. When she left there was many things she wasn't happy about. First off, she didn't know how to speak English. And secondly, she didn't know how things worked in her area. She was nervous and scared because she wasn't with her parents. But at least she got to be with her brother Hans. After living in London, a lady came to take her further away from London. She then took her 45 minutes away from London to somewhere else. While she was at boarding school there, the Germans were starting war close to London. Even 45 minutes away, it wasn't safe. So they decided to take Olga even further to the country in Wellingborough. At last that was her last stop. In Wellingborough, she started school and learned how their ways were. As she got older, she could finally find a job as a nanny. She chose that job because she can get paid for it and she really likes the kids that stay there. Then her parents sent her the letter she has been waiting for. It said that they had got her visa and she could come to America to live with them. She then took a boat to New York. From there she took a train to Grand Central Station and there is where she saw her parents once again. This book reminded me of a dream I had where I was sent to Russia to serve as a slave. When I read this book it kept reminding me of that same dream every single page. I would definitely recommend this book. I thought this book would be bad but I was wrong. It was an excellent book. It was a mix between adventure, realistic fiction, and an autobiography. I'm not so sure but 5 out of 5 stars.